What should I get my brother for his birthday today? A cheap monitor might be nice, or maybe a discounted camera and video games. Oooh—or perhaps a bunch of free stuff—he'll never know. • 22'' ASUS Widescreen LCD Monitor for $149.99 plus free shipping (normally $189.99 - use this rebate form). • 22'' Dell 1080p Widescreen Flat Panel Monitor for $159 plus free shipping (normally $259 - use coupon code 1FZZMBB86GW7W9). • 19'' Dell Widescreen Flat Panel LCD Monitor for $109 plus free shipping (normally $199 - use coupon code N?37BNFZT2TSD9). • USB 3D Optical Scroll Wheel Car Mouse for $7.99 plus free shipping (normally $19.99). 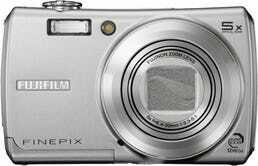 • Fujifilm Finepix 12MP Digital Camera for $166.54 plus free shipping (normally $266.54 - use this rebate form). • Olympus FE-20 8MP Digital Camera for $69.99 plus free shipping (normally $99.99). • Pure Digital Flip Video Ultra Camcorder (30 minutes) plus $20 Shutterfly Credit for $59.99 plus free shipping (normally $89.99 - use promo code 67P7PZO3). • Little Big Planet on PS3 for $21.90 (normally $59.99 - valid through 3/20). (Sold out—check here for LBP for $20). • Viva Pinata on Xbox 360 for $9.99 plus free shipping (normally $19.99). • Silent Hill: Homecoming on Xbox 360 for $24.99 plus free shipping (normally $39.99). • GoGamer 48 Hour Madness Sale (including Guitar Hero Aerosmith on Wii for $11.90, Prey on PC for $2.90, Saitek Optical Mouse for $1.90, NCAA March Madness on PS3 for $5.90, Rainbow Six: Lockdown on PC for $4.90 and more). • 42'' Vizio XVT 1080p LCD HDTV for $749 (normally $899). • 32'' Westinghouse LCD 720p HDTV (refurbished) for $299.95 (normally $400). • iRiver E100 8GB MP3 Player for $59 (normally $99.88). • Philips GoGear 4GB Media Player (refurbished) for $29.99 plus free shipping (normally $59.99). • iPhone/iPod USB Cable Car/Wall Charger for $3.99 plus free shipping (normally $9.99). • iPod/iPhone FM Transmitter with LCD Display for $9.99 (normally $19.99 - use coupon code lcdfmt). • The Dukes of Hazzard - The Complete TV Series (Seasons 1-7) for $93.99 plus free shipping (normally $176.99). • Firefly on DVD for $19.99 (normally $49.98). • Chuck - Complete First Season on DVD for $19.99 (normally $39.98). • Carnivale - The Complete First Season for $15.99 (normally $39.98). • 8x10 Portrait for $0 (normally $9.99 - valid until 6/1). • McDonald's Small McCafe Latte/Mocha/Cappucino for $0 (Valid on Tuesdays until 2PM). • XTREME Autobody T-Shirt for $0 (must fill out a survey—make up your answers). • Source of Life Shaker Cup for $0 (must fill out a survey—make up your answers again). • Gytone Step-Up Travel Sized Kit for $0. • The Laundry's Finest Laundry Powder for $0.